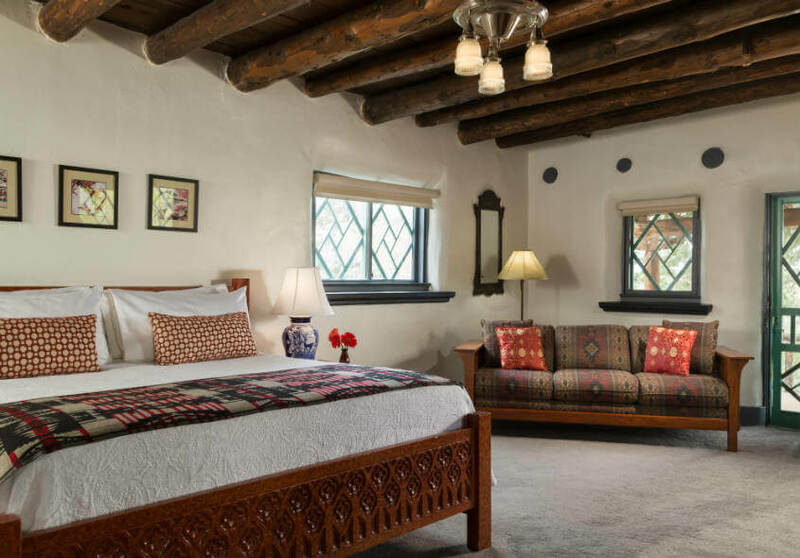 Come experience our beautiful gardens, thoughtful amenities, and personal service that will turn your stay at our Santa Fe bed and breakfast into a tradition. 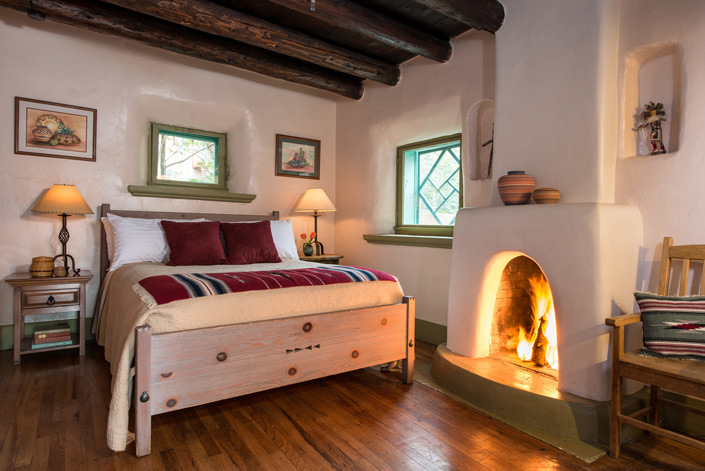 You will find each room and suite offers a unique Santa Fe lodging experience. Every room has its own unique character, as befits a rambling adobe estate built, transformed, and restored over a 150 year period. 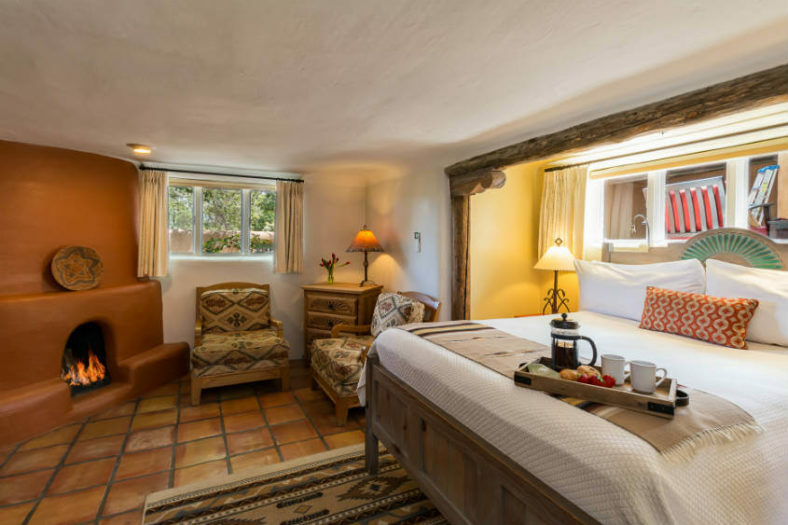 Our three course Santa Fe breakfast, afternoon tea, and twilight wine reception are included in the room rate. 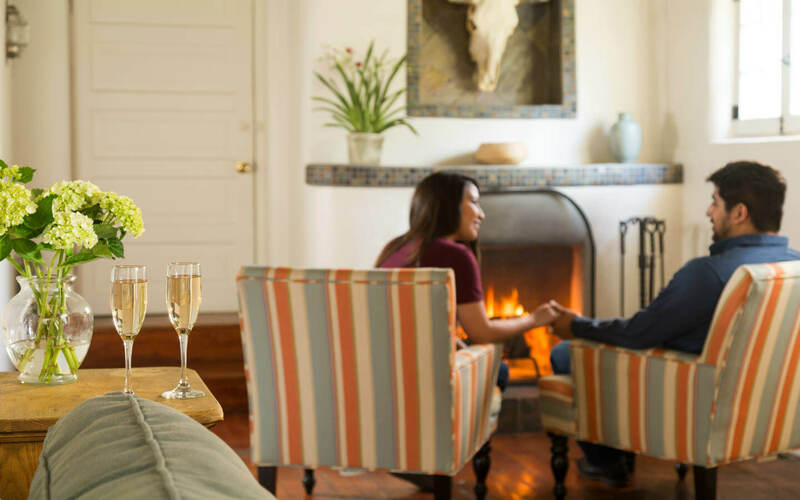 Our wood-burning fireplaces are available for guest use from October 15 – March 31 each year. Please Note: Our Inn is a historic property with 20 or more steps to the main inn and perhaps more to your room. If you have accessibility concerns, please contact us so we can assist you with the best solution! View our Accessibility Policy. * Please note that this is a historic property with several steps, stairs and uneven surfaces. If you have accessibility issues, please contact us so we can assist you with the best solution! 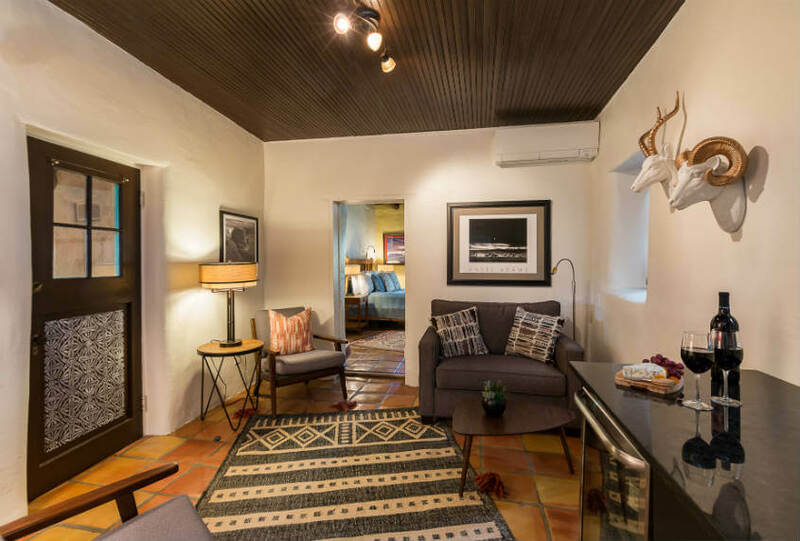 Please read the “small print” carefully for our Santa Fe B&B. If you have a question, call us at 505 983 0798 and we will gladly explain. Check In – Check-in time is from 3:00 pm to 5:00 pm. If you will arrive after this time, please notify us well in advance so that we can provide you information essential for an after-hours self-check-in. NOTE: There are 20 or more steps from our parking area to the main Inn. We are happy to assist you with luggage upon your arrival if arrival is prior to 5:00 pm. Check-in at the Inn's office and we will retrieve your luggage for you. There is no attendant on premisis after 5:00 pm. Check Out – Check-out time is before 11:00 am. Alternate check out times can sometimes be accommodated if pre-arrangements are made. Please check with us. Room Pricing – Rates quoted are for single or double occupancy. 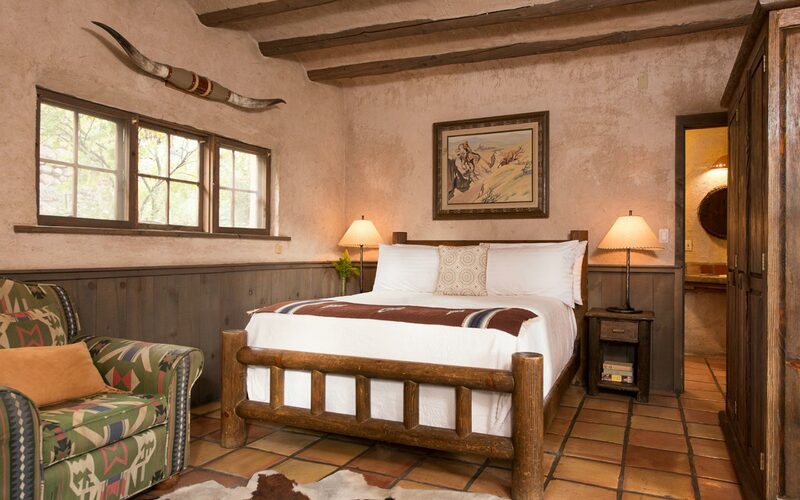 Our rooms can accommodate two people very comfortably and several can accommodate three. See the rooms page for details. There is a $30 per day charge for each additional person in the room age two or greater. There is no additional charge for one child 2 years old or less in the room with the parents. Deposit – All reservations must be secured by a deposit of 50% of the total lodging cost with taxes. Any outstanding balance is due upon check-in. The deposit can be paid with a credit card (Visa, MasterCard, American Express and Discover) or check that must be received within one week of booking the reservation. Guests who pay the balance of their account upon arrival with either cash or check, will receive a 3% discount on the remaining balance due. 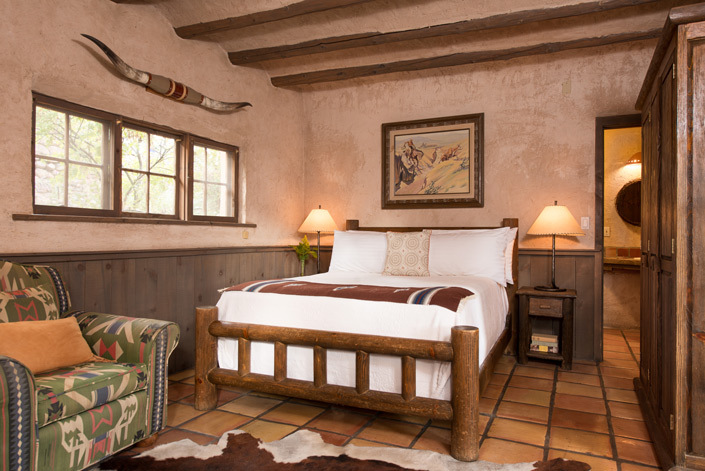 Minimum Stays – A two-night reservation is required during high season (April 1 through October 31 if a Saturday is booked). Sometimes a single Saturday night is available, please call us. Also, minimum stays of 3 or 4 nights are required on most Holidays, Art Market weekends and other special events. Call us for details. Cancellation Notification – If your plans require that you cancel your reservation, we will gladly refund your deposit (less a $50 plus tax per room cancellation fee) provided that we are given sufficient notification of the cancellation in advance of the confirmed arrival date. Reservations canceled, or stays reduced, greater than 14 days (30 days for holidays, special events, July & August) prior to originally confirmed arrival date will receive a refund of any deposit, less a $50, plus tax per room, handling fee which will be deducted from the refund. Reservations canceled, or stays reduced, 14 days (30 days for holidays, special events, July and August) or less prior to confirmed arrival date will be responsible for the entire reserved stay. This is also true for “no-shows”. Whole-Inn or Group Bookings – Booking the entire Inn for a private event may be available depending on the date and availability. Whole-Inn Bookings are not available in July or August. Our Inn has 9 rooms with total capacity for 20 persons. A three night stay is required to book the entire Inn. For whole-inn bookings or for group bookings where rooms are blocked before reserving, there is a 20% surcharge per room, per night. There may be additional space use fees should the property be used for activities or events outside of our typical breakfast service and twilight reception. Payment must be made from one source for each room with 50% of the total charges due at time of booking and the remainder due 30 days prior to check-in. Call the Inn to discuss the possibility of booking your group or the entire Inn for your event. Travel Insurance - As a small Inn we require your commitment to your reservation. Reservations are accepted with the understanding you will be financially responsible for the entire period reserved. We cannot be responsible for illness, family emergencies, work conflicts, inclement weather or cancelled flights. We highly recommend purchasing trip cancellation insurance, available at a nominal cost from any travel agency or online at insuremytrip.com. These companies are independent and not affiliated with our hotel. Groups & Celebrations - Whole Inn booking is available for groups and special events such as weddings, corporate board meetings, reunions, workshops, retreats and professional meetings. Inquire about rates. Additional charges or event contract may apply. Additional cancellation charges may apply. Pets – We love our pet guests! Pets are allowed in the Shaman, Spud Johnson, Igor Stravinsky, and Edna St. Vincent Millay rooms. Please see our pet friendly page for specific pet policies. Lost Keys - There is a $20 charge for each set of room keys lost or not returned upon check-out. Smoking – There is no smoking allowed in any guest rooms or the Inn’s common spaces. Evidence of smoking in guest room or common space will result in an additional $250 cleaning fee. Smoking is permitted in all exterior spaces. Ashtrays are available. Drought Water Restrictions - The city of Santa Fe is experiencing on-going severe water drought. 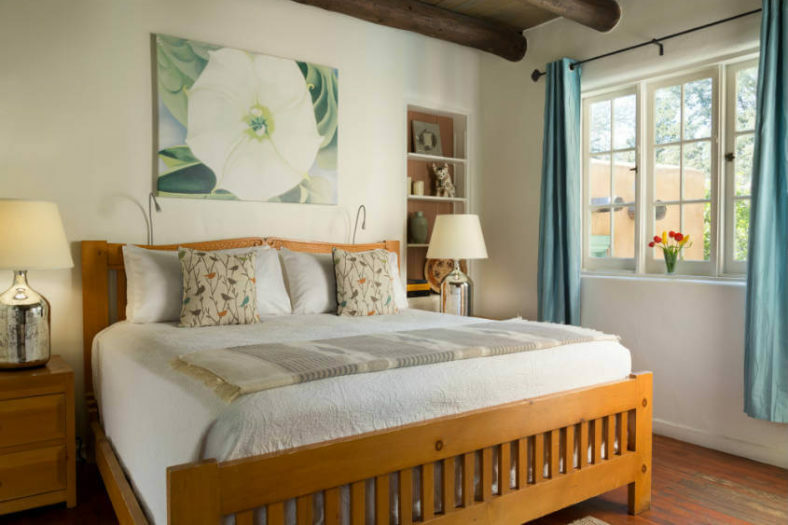 We must adhere to City of Santa Fe’s ordinance that lodging facilities shall not change sheets and towels more frequently than every 4 days for guests staying longer than 1 night. Please do not place your towels on the floor, but hang them in such a way as they may be used the following day. Should they be found on the floor, our housekeeping staff will place them neatly on the towel racks for reuse. Guests are liable for any damage or loss of hotel property, or should extra cleaning be necessary. Accessibility Policy - Inn of the Turquoise Bear warmly welcomes all guests. Listed on the National Register of Historic Places, the main inn of our 1880’s estate has not been altered in any significant way in order to retain its authentic Northern New Mexico importance. 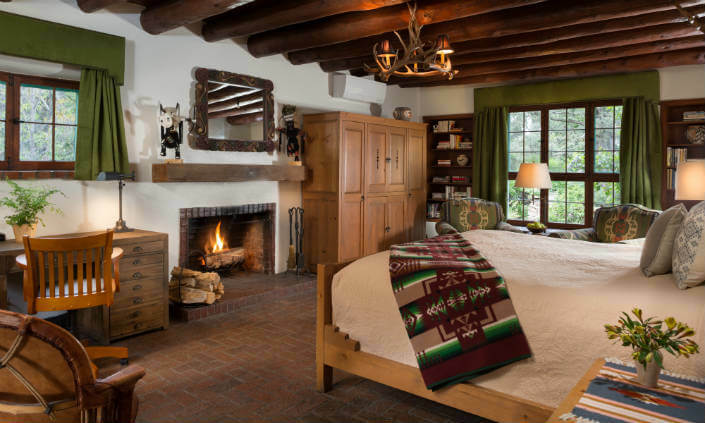 Due to the historic relevance of our Santa Fe Inn, the main inn is not wheelchair accessible due to the numerous steps to the entrance. Removal of necessary physical barriers for accessibility is not achievable as such removal would threaten or destroy the historic significance of the properties. 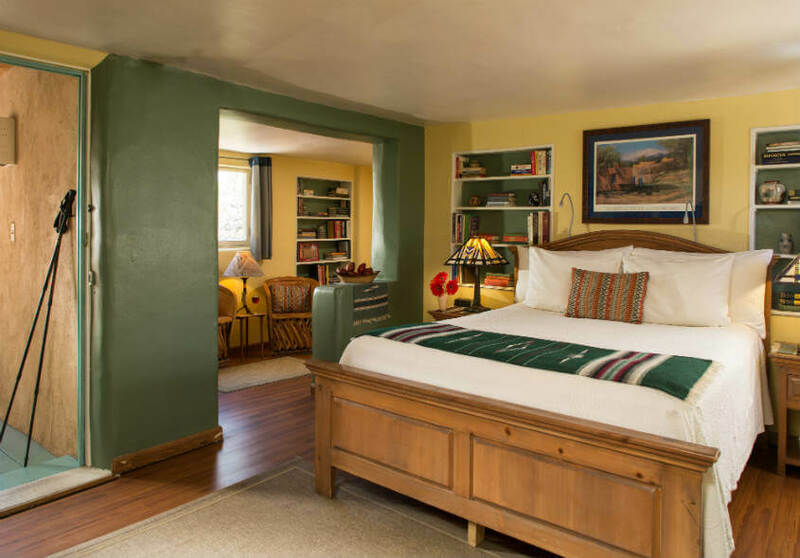 However, we have worked extensively to accommodate all guests by offering accessibility accommodations with our Willa Cather Room. 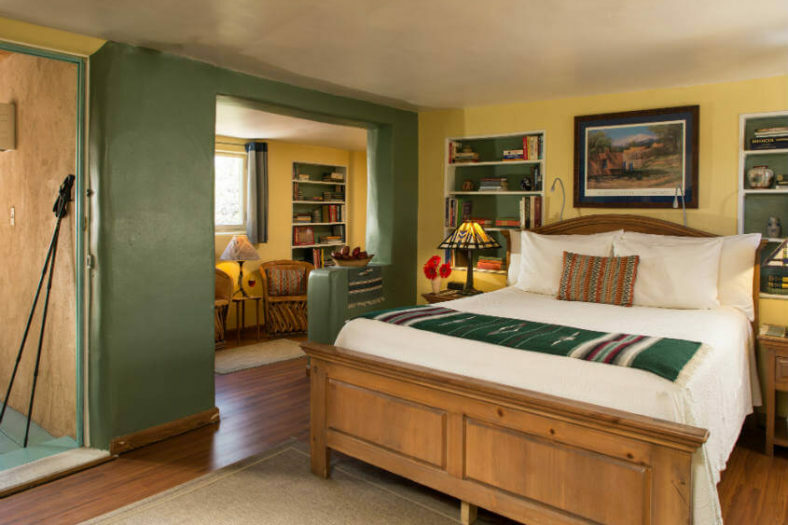 Accessible Accommodations - The Willa Cather Room is separate from the main inn and adjacent to the Inn’s circular drive. Accessible from its own private portal, this room offers a private ensuite bath which includes a large walk-in ADA compliant shower, roll under sink, grab bars and hand-held shower head. (Please be aware that the shower is not a roll in shower as there is a small lip when entering the shower). There is designated parking that offers direct accessible access from the parking area to the private entrance of the Willa Cather Room. We offer room check-in for our disabled guest and are happy to assist you with luggage upon arrival if arrival is prior to 5:00 pm. Although direct access to the dining room is not accessible, with prior arrangements, our disabled guest can enjoy our freshly made bountiful breakfast in the comfort of their room. If you require other items please inform us prior to your stay, and we will be happy to work with you to assure an exceptional Santa Fe stay and experience. You can call us directly at 508-983-0798. 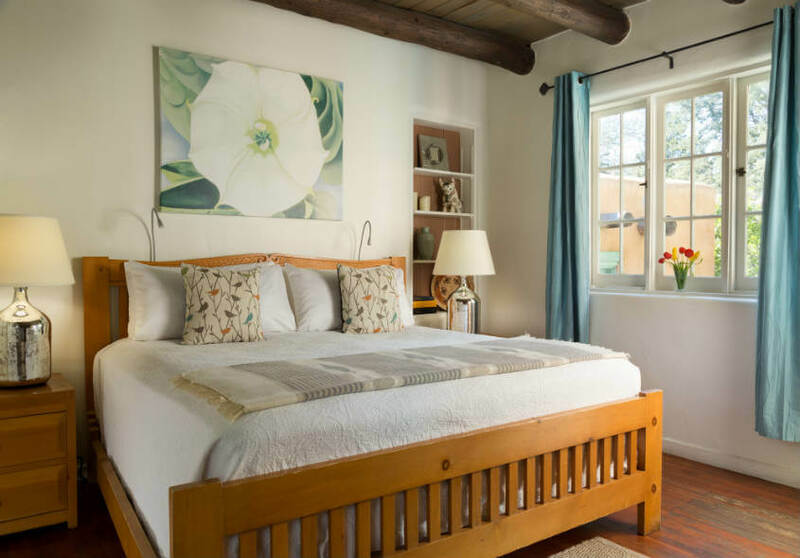 We have identified and described accessible features and inaccessible features for the Inn and guest rooms in detail to allow individuals with disabilities to determine whether our B&B meets their needs. Website Accessibility - We are committed to facilitating the accessibility and usability of this website for all people with disabilities. We will continue to implement the relevant portions of the World Wide Web Consortium's Web Content Accessibility Guidelines 2.0 Level AA (WCAG 2.0 AA) or such other standards as required by the Americans with Disabilities Act (ADA). On a periodic basis, our website will be tested with assistive technology. Please be aware that our efforts are ongoing. 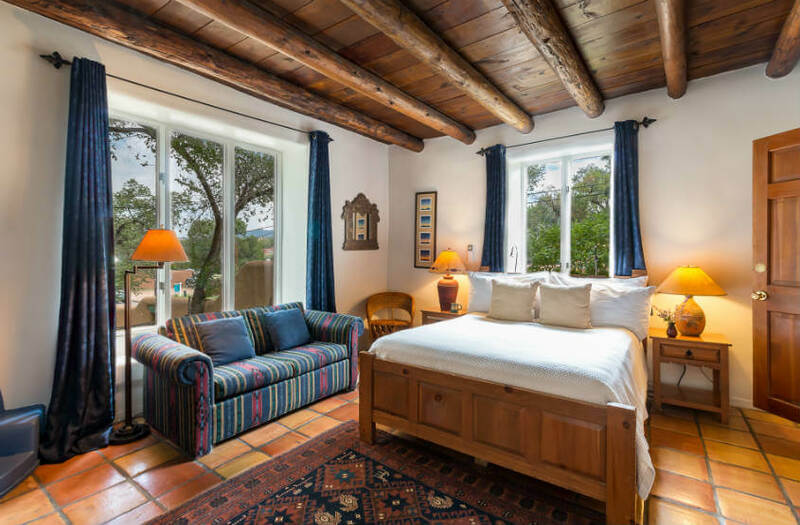 You may email us at innkeeper@turquoisebear.com or call us 24/7 at 505-983-0798 with questions or concerns regarding accessibility, including issues accessing the website or with questions regarding the accessibility and your personal needs of the property. NOTE: To view the location of a room on the property, click on the room name in the left sidebar.